Executive Chef Tim Eylens (left) plans a casual, New American menu at Del’s Hideaway for restauranteurs David and Lesley Cohn. 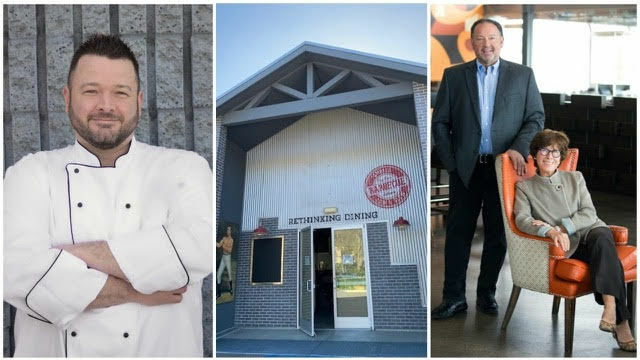 The Cohn Restaurant Group plans to open a casual restaurant with innovative “call button” service in San Diego’s Del Cerro neighborhood, which has been underserved by restaurants. Del’s Hideout, a 5,400-square-foot family-friendly restaurant and bar, is set to open in March at 5351 Adobe Falls Road. Co-owners David and Leslie Cohn describe the location as “off the beaten path, but freeway close.” They have a reputation for creating concepts in underserved neighborhoods to help transform these areas into hospitality destinations. The new restaurant will provide diners with Kallpod‘s three-button GPS device that can be used after ordering at the counter. By pushing buttons, guests can easily order another round of food and drinks. Executive Chef Tim Eylens plans a casual, new-American menu, pulling from regional and national styles while incorporating local flavors and ingredients. The menu will feature healthful options such as entrée-sized salads, but also burgers, rotisserie chicken and Texas-style BBQ. A full bar will offer 36 beers on tap. Del’s Hideout is being designed by longtime Cohn collaborator Phillippe Beltran. The restaurant will feature both indoor and outdoor dining spaces with 700 square feet of patio separated by floor-to-ceiling roll-up garage doors. A recycled shipping container is being transformed into a children’s activity zone complete with stationary iPads for educational gaming. At the end of the meal, servers will deliver ice cream cones for diners to enjoy via a self-serve station on their way out. The Cohn Restaurant Group owns and operates 25 restaurants in San Diego, Long Beach and Maui.